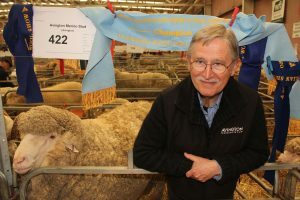 ASWGA member Noel Henderson at the recent Australian Sheep and Wool Show. The former Australian Superfine Wool Growers Association vice president was due to take over the ASWGA leadership from Tasmanian grower Simon Cameron, at its annual general meeting in Melbourne last Friday. His resignation came just before ASWGA members were due to discuss at the AGM a proposal to include a cease mulesing clause in an animal welfare policy. Avington at Sidonia in Victoria’s north-east ceased mulesing sheep seven years ago and has embraced a number of industry standards and guidelines. These include New Merino, SustainaWOOL, the IWTO Guidelines for Wool Sheep Welfare and the Australian Animal Welfare Standards and Guidelines. The flock was the first in Australia to be certified by Textile Exchange’s Responsible Wool Standard, which bars mulesing. Mr Henderson said for some time now a number of ASWGA members have been questioning whether the association is capable of change. “My feeling is it (the ASWGA) is not going to change in the near future — it is going to talk about change, but it is not going to be able to change. “I just don’t want to be restrained by that lack of momentum,” Mr Henderson said. He said he was not giving up on trying to influence the industry now, or in the future. Voting on a proposed animal welfare policy for the ASWGA is expected to be finalised this month. The proposed policy was discussed at its 2017 annual general meeting in Melbourne last week, but new ASWGA president Danny Picker would not disclose any details until it was discussed by the New England members and other branch leaders later this month. Last month, Sheep Central was told the ASWGA executive had been canvassing membership support for a ‘cease mulesing’ clause in an animal welfare policy. Members of other ASWGA regional branches discussed the policy wording with then ASWGA president Simon Cameron in the weeks before the annual general meeting. All ASWGA members will be notified of the policy before its general release. Mr Henderson said Italian and Japanese processors all want change within the Australian industry around mulesing. “My recent trip to Biella was a privately arranged and I managed to meet with many of the key Italian processors and get their feedback on how they see the Australian market. Mr Henderson said he is encouraged by the growing demand from China for unmulesed wool. “Social awareness will ultimately drive change in regard to animal welfare. Mr Henderson said Italian processors were “still smarting” from the Australian industry’s decision to renign on the commitment to cease mulesing by 2010. “There is clear evidence that they have increased their buying out of New Zealand; they’ve gone to South Africa to get supply. “We’re getting the same information from a Japanese group that we know well,” he said. “I just don’t think that the industry at the moment, particularly the superfine industry through ASWGA, will be able to be responsive; they are going to take perhaps three to four years. “I am not Robinson Crusoe in this; there are a number of like-minded growers and there is discussions about how we band together and don’t get dragged backward by their mulesing issue,” he said. He said Avington embraced animal health and welfare standards, environmental management, sustainable production and traceability, because the issues were important and demonstrated social responsibility. “We tested the way we are operating earlier this year in submitting to an audit by RWS and the result showed we have achieved world’s best practice in our operations. “This does not mean we accept that the RWS is totally right at the moment for our industry, but there is no other third party certification process available,” he said. Mr Henderson said the whole supply chain from wool grower to retailer needs to be transparent and consistent in quality standards to satisfy the discerning retail customer. “To survive in the current and future market individual farmers, and industry organizations, will need to be aware and responsive to demands and not bound by tradition. “The future for Avington is a focus on working with like-minded wool growers that have a common interest,” he said. “The only way to address this is to be definitive; say within two years, this is what the Europeans want to hear – they just want a commitment. Mr Henderson said the membership about 10 years ago was 210 and today it is probably about 90. It’s clear the industry and the market are struggling with mulesing. We mules our ewe lambs only, at lamb marking with Tri-Solfen for pain relief. It is essential in our high rainfall environment to help prevent fly strike. Tail docking and castration with a rubber ring seem to me to be a far more painful operations than mulesing itself; all performed at lamb marking. So if you mules you will receive a discount because the market says ‘it’s cruel’. Yet you can tail dock and castrate, which is essential, and 99.9 percent of farmers do it, but ‘they don’t inflict pain’, so get their wool sold without fuss. Is the market this stupid? No, it’s not, just poorly informed. I am proud of the fact I have 8 and 9 year old ewes still doing their job and loving life. Over that period of time, if they were daggy and covered in chemicals there is no way they would still be with us. The market needs to understand this. Losing any sheep to fly strike is a far worse animal welfare issue and I’m not a farmer who will tolerate the risk of his sheep being eaten alive and I would hope I’m not alone. Forty years ago in Tenterfield NSW I saw mulesing first-hand. As a child, I was horrified at this crude and terribly painful cruel procedure. The fact that farmers are still doing this to sheep is despicable. There are ways to control flystrike and they know it. Pure barbarism. If there are no rewards for the farmers with good animal welfare practices, including non-mulesing, why would farmers want to lose income by having less wool and putting extra time into the animals? Especially when farmers that do not practise good animal welfare practices, will still produce more wool and meat with less work and sell for the same price as those who do? Is it then foreseeable to say that those who are practising good animal welfare practices, may fall financially behind, while those who do not move forward and could inevitably buy out those who do? I think that in order for the industry to move forward with the demand for good animal welfare practices in wool or meat production there needs to a monetary incentive to create change. Without incentive change could take many years. Further to this, it should currently be mandatory for those who do mules to use the available pain relief. Tim Mort, the decision not to mules should be made on the evidence of pain and suffering, not on demand, or economics. As indeed should the decision — or change to the Animal Welfare Act to force that decision — be made on all other painful surgical mutilations and disfigurements carried out in animal agriculture under the guise of ‘routine animal husbandry’. A very encouraging story to hear Avington have clear and sustainable practices in place and they have proved their operation does not need to mules. Congratulations Avington. May others follow in your footsteps. If the Italians want change, then as wool buyers they should provide a premium for unmulesed wool in the market. Jumping up and down complaining will get you nowhere. As a wool grower, why would you take on the extra cost of not mulesing if all it means is that you decrease the margin you make on your wool? I encourage the wool buyers to take partial responsibility in the animal welfare issue by paying a premium for unmulesed wool, which will consequently allow wool growers to play their part by having an incentive not to mules.